There are currently around 30 sections of road in New South Wales that are monitored by Average Speed Cameras. Their principal targets are heavy vehicles on rural roads. Heavy vehicles make up only 3% of vehicle numbers and only 7% of total kilometres travelled, but they are involved in 35% of fatal accidents. 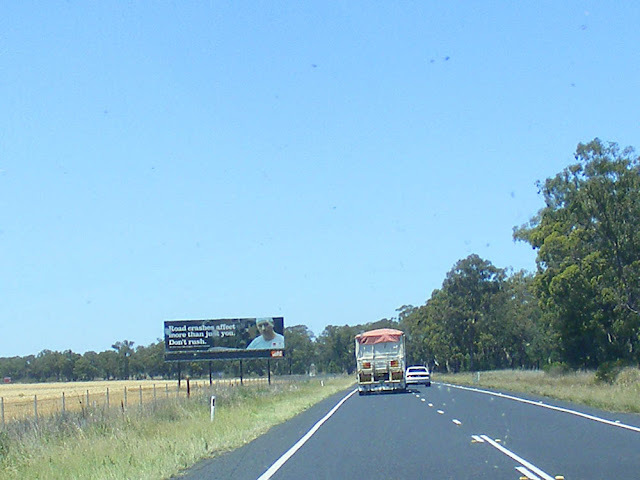 Surveys have shown that about half of all heavy vehicles habitually exceed the speed limit. 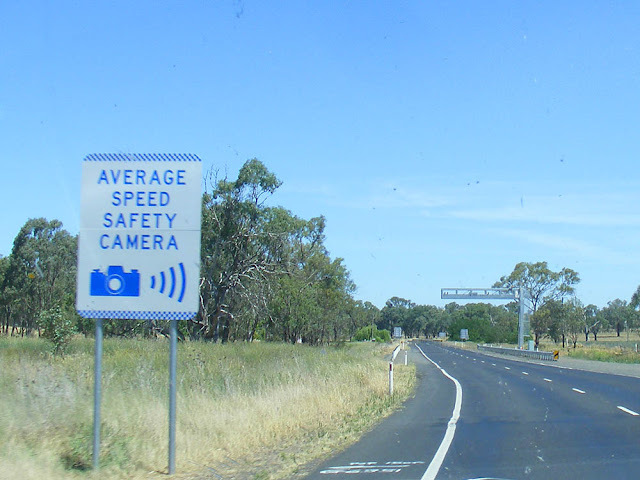 The cameras work by photographing vehicles as they pass under two camera booms set a known distance apart. Each photograph is registered with the time and so a calculation of average speed can be made. Drivers caught speeding are dealt with according to previously existing speeding laws, plus they lose an extra point from their licence, as 'offences detected by point-to-point enforcement demonstrates a continued intention to speed'. Speeding penalties range from the loss of one point and a fine of AUD$105 if you are caught doing up to 10kmph over the limit, to licence disqualification for 6 months and a fine of AUD$3740 for exceeding the limit by 45kmph. Penalties for heavy vehicles are more severe than for cars and penalties for speeding offences in school zones are also more severe. Any speeding offence results in a 3 month suspension for learners and those who have held a licence for less than a year. If you are caught doing 45kmph over the speed limit the police can confiscate and suspend your licence on the spot. There are thousands of speed cameras on roads in France, and since 2011, no signs warning you that you are approaching one. 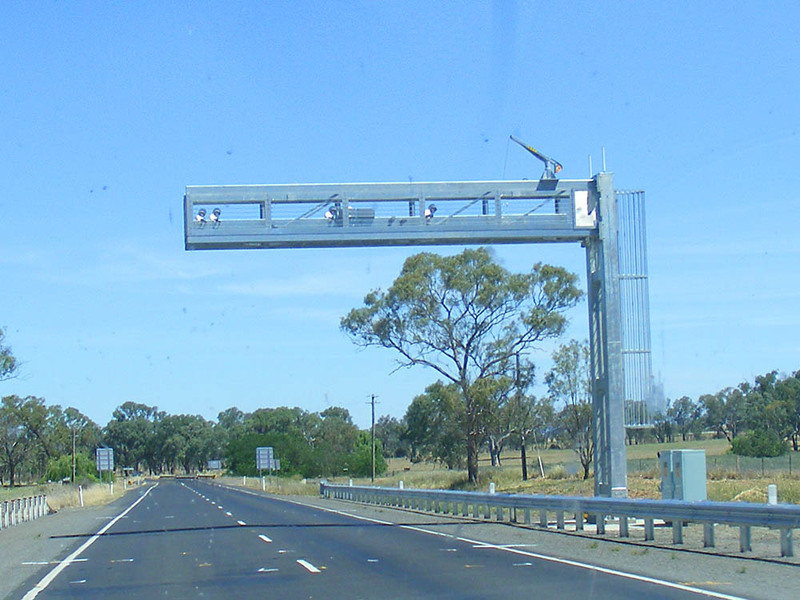 Average Speed cameras are also increasingly being installed on motorways. Also increasingly common are panels which show your speed as you approach in coloured lights. Often they give you a smiley face if you are within the speed limit, and corny as it sounds, this feedback is remarkably effective. If you are caught by mobile radar, French speeding fines are generally payable on the spot. If you are caught by a camera, the fine will be posted to you. For serious offences (exceeding the speed limit by more than 50kmph) the police will confiscate your licence and impound the car. You lose your licence for 3 years and if it is a first offence the fine is €1500 or €3750 if a second. Winery News: Two of our favourite wineries are involved in special promotion days this weekend. Chateau Gaudrelle, right on the river Loire in Rochecorbon, just outside Tours and in the Vouvray AOC is hosting open days this weekend and next, with special offers on the wine and an exhibition of paintings and photographs. Domaine du Clos Roussely, based in Angé (just across the river from Montrichard) in the Touraine AOC are going to be at the Salon Les Vins du Coin in Blois this weekend, held in the Espace Jorge Semprun from 10 am to 7 pm today and tomorrow. A la cuisine hier: Leek Soup, made on a base of celeriac and broccoli puréed and thinned with chicken stock before adding sweated sliced leeks and a dash of milk. Not as good as on a mashed potato base. Veggie Burgers with tomato salsa and green salad. They turned out rather well and are ever so healthy. I reckon the burger mixture might make a good stuffing for cabbage rolls too, so I will try that some day. 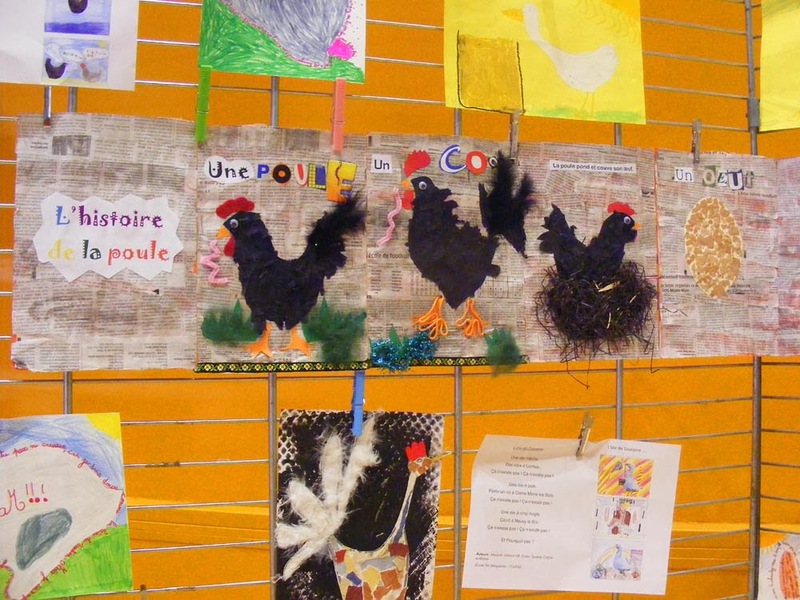 I believe a Loches primary school pupil has answered the age old question quite nicely. And in case you are still wondering, this school project came about because the local breed of chook, sometimes referred to as 'the black lady of the Touraine', celebrated its centenary this month. This charming painting belongs to our friend Bernard de la Motte. He intends to offer it to be hung in the Salle des Fêtes after it has been restored. I love its soft colours and the buxom women in simple summer dresses. The man in the hat on the left could be from the village today, but the woman next to him in the Tourangeau bonnet would never be seen now. The dogs in the foreground are wonderfully natural and the whole scene bathed in a sort of honeyed glow. 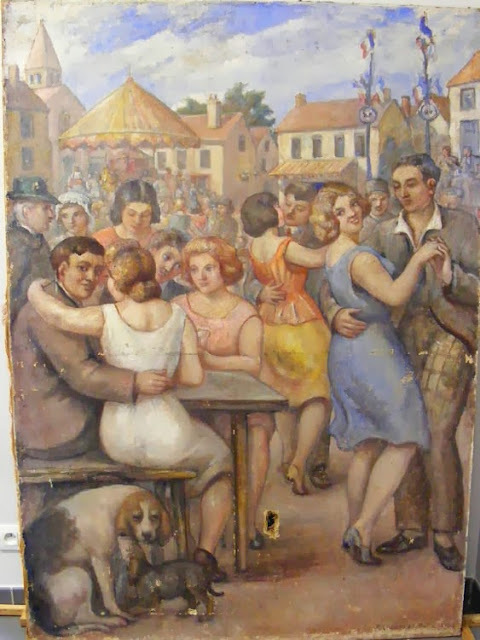 It was painted by his father in 1947 and Bernard thinks it depicts Bastille Day celebrations in Bossay sur Claise. The characters portrayed are real people from the village and Bernard would like to put names to the faces. He thinks the red-headed woman in the pink dress in the centre, sitting on the corner of the table, is his mother, and he can guess the identities of a couple of other people, but apart from that he has no clue. So if you can identify any of these people please let us know by commenting on the blog, emailing us via our profile links on the right side bar or getting in touch with Bernard directly. On Thursday 21 November I attended a meeting at the mairie (town hall) and then a site meeting to discuss a way forward with the restoration of the Chapelle de Tous les Saints. Bernard de la Motte, President of the Société d'Archeologique de Preuilly (SAP), has been beavering away in the background, networking like mad and making contacts who may be able to help. He's contacted every organisation he can think of who might be willing to offer technical assistance or a grant. 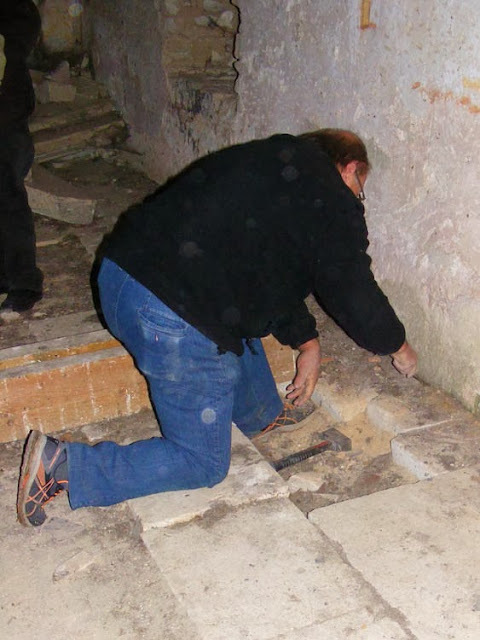 Jacques lifting a paving stone to check the original floor level, which was lower. Along with him and me at the meeting there was Gérard Thoreau, the deputy mayor and fellow member of the SAP, Jacques Guionnet, an architect and deputy departmental officer for the Fondation du Patrimoine (Heritage Foundation), Sabine de Freitas, a wall paintings conservator, and Corinne Tual, a muralist. Photos, including those taken by Simon for the project, were handed round and Bernard spoke about the 20th century history of the chapel. The heritage professionals studied the photos and outlined the main risk factors they expected for the building. Sabine said the paintings appear to be absolutely typical in terms of style and pigments for this area at the very beginning of the Renaissance ie the end of the 15th century to the beginning of the 16th. They expected the main problem to be damp, but preventing entry by animals would also be important, and removing any cement based render. Everyone agreed that stabilising the building must be the first step, and work on the wall paintings must come later. It emerged that the paintings are not included in the official classification of the building as a historic monument. Bernard would really like to get this anomaly sorted out and Jacques agreed, but didn't think it was too much of an issue. 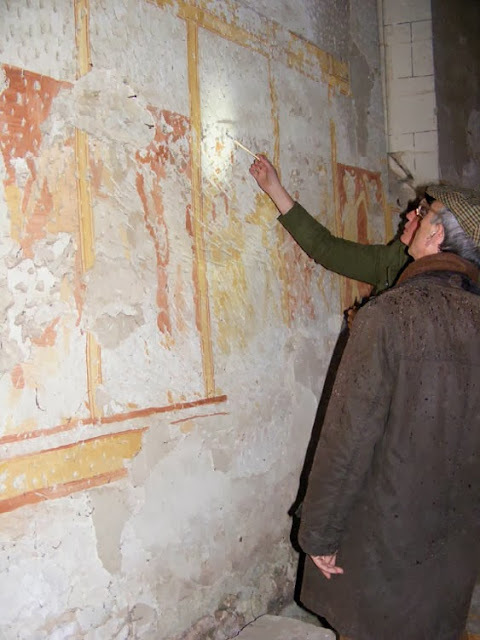 Sabine gently investigates the wall paintings using a small dry brush while Bernard holds a torch for her and watches the procedure with interest. The poor state of the carpentry was discussed and Jacques outlined a method by which a steel bar fixed with resin could be inserted into the main cross beam. Bernard (or Gérard) has got quotes from local masons and joiners just so we have an idea of how much the work will cost. There was some discussion about choosing an artisan who has the right delicate touch with restorations of this nature. Everyone agreed that an 'as new' look is not desirable. 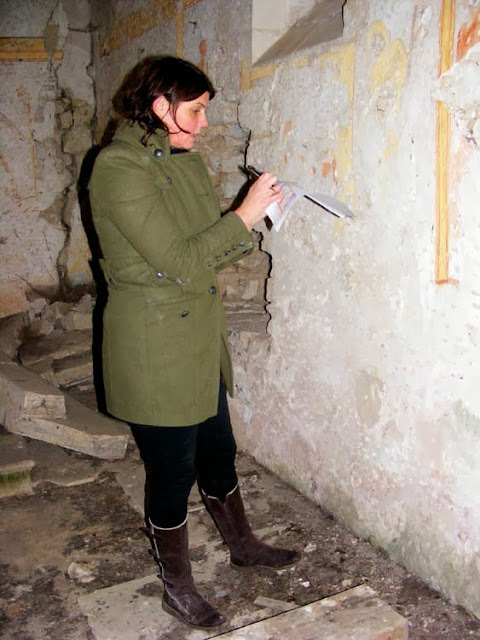 The quotes from firms such as the Loches based Menet, who do most of the serious historical restoration in the area, indicate that our budget for the building (excluding the wall paintings) should be about €35 000. Fortunately the roof is in quite good condition, but the walls, carpentry and floor all need work. Bernard has also spoken to an commercial architect who is experienced in heritage projects, and luckily the heritage professionals attending the meeting all knew and liked the architect Bernard named. It is the facade facing the street (the north wall) and the rebuilt western gable end that Jacques Guionnet felt were likely to be of the most concern, as damp could be causing colonisation by various organisms. He was also concerned about the floor, because there is a chance that there had been an earlier building on the site. He guessed correctly that the building does not have any foundations, and was probably just built on a bed of crushed limestone. 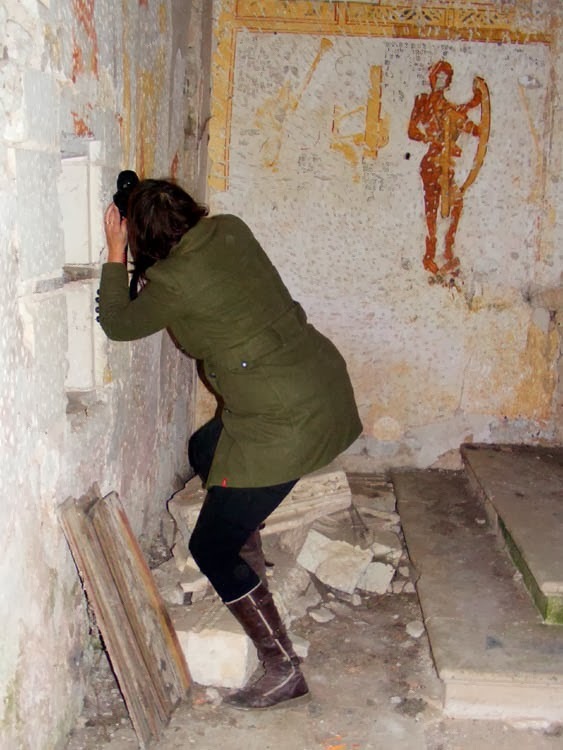 Sabine knocking the walls to see how well the plaster substrate to the paintings is adhered to the wall. Gérard was able to reassure him that the soil isn't wet and the ground and the timbers have been tested for humidity. The floor along the walls is in good condition, although it is missing from the centre of the building. Sabine initially felt that fungal and algal growths were a real risk, but after a site inspection announced that the walls just have algae, with no sign of fungi or salts. Fitting the roof with gutters and downpipes and creating a drain on the north side is crucial. The building would not originally have had gutters, but today it is considered a necessary compromise in order to safe guard the structure long term. Jacques suggested copper guttering, which everyone agreed would be lovely, but much more expensive. 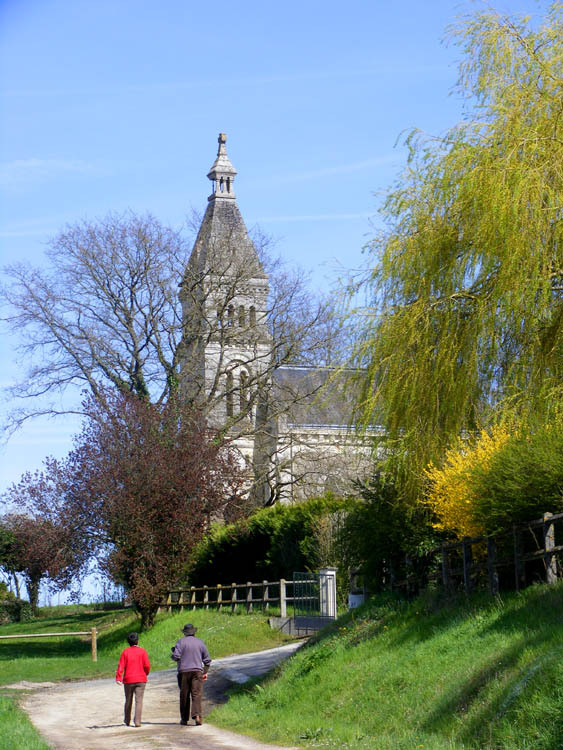 There was some discussion about the church at La Celle Guenand, which has been closed for years and has the most terrible damp problem and as a consequence is host to a myriad of micro-organisms. Everyone is very shocked by the state of this building and the lack of action to sort it out. The village of La Guerche also came up in the discussion, held up as an exemplar of how well a village full of historic buildings can be maintained. Sabine using a scalpel to gently remove layers of render and expose the underlying painting, to compare its condition to that which has been exposed for some time. 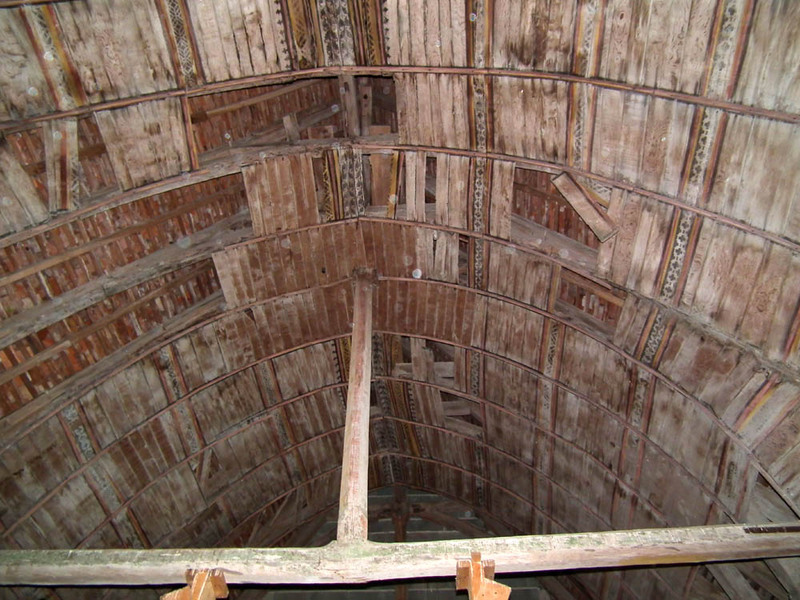 Jacques outlined how the restoration project could be funded, with the Fondation du Patrimoine's help. The first thing is to raise a public subscription, aiming to collect 10 - 12% of the total project funds. Once we've raised about 5% we can call for tenders to do the work. The Fondation specialise in small, often vernacular, heritage building projects and are able to help both public organisations and private individuals. They can grant a maximum of €25 000 to a public body and up to 65% of the funds for a private project (I think I have that right). An alternative is we apply for grant money to be given in tranches, with each stage having to be completed to the Fondation's satisfaction before the next tranche is released. Along side this our public subscription must run for the length of the project. The chapel at Ste Maure de Touraine was also referenced and their fundraising flyer presented as the type of thing we should be producing. Ste Maure used the funding in stages type of grant. 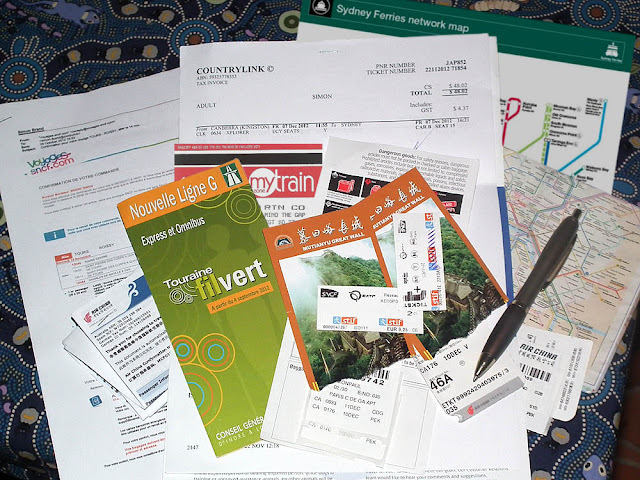 The idea is for the fund raising and project management to be administered by the SAP, with support and technical advice from the Fondation du Patrimoine. The commune of Preuilly would have to join the Fondation, but for communities of less than 1000 the fee is just €50, so not too onerous I would have thought. Sabine marking the areas of concern on a diagram of the paintings. A third alternative, which also has the advantage of meaning the project can start quite quickly is to use the first part of the project as a training opportunity, taking youngsters who are learning to be masons to work under the supervision of an experienced mason. This is the less sensitive part of the project in terms of the technical skills required but setting it up is apparently quite complicated (there are legal issues about who can pay whom). Luckily, Jacques is very keen on this sort of solution, and is the driving force in the Fondation for establishing it as a way of working. The students would concentrate on repairing the bases of the walls to 30cm below ground level and re-doing poor repair work on the gables. The upshot is that they think the project is worthy and Jacques has agreement in principle for the Fondation to assist us. It is clear that the heritage 'industry' is really complicated, and he made the comment that many communes are not up to date with all the organisations who can help and how they interact. This is where his experience will prove invaluable. Sabine taking a close up photo of the various layers on the wall. 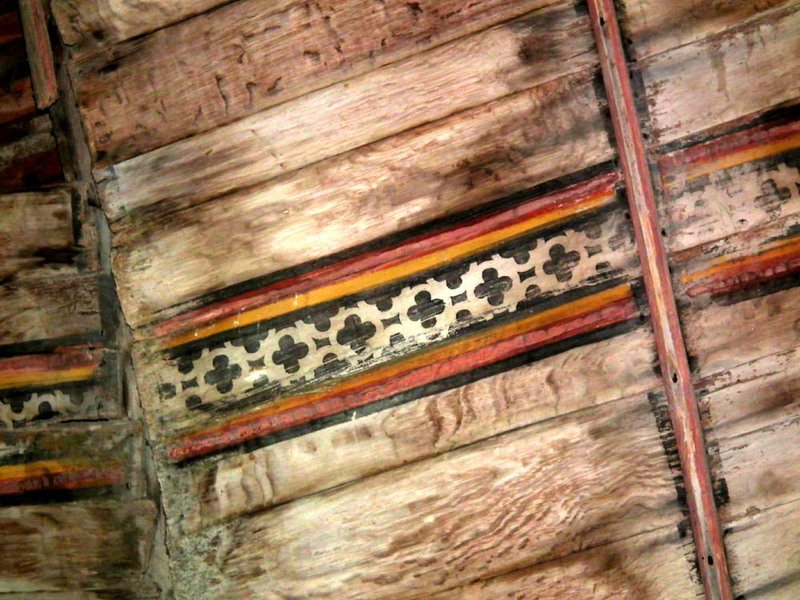 With regard to the paintings themselves, Sabine's assessment is that it is not a terribly difficult job to stabilise and clean the wall paintings and the polychrome oak vaulted ceiling. She would retouch a few areas where there are gaps, but a wholesale repainting is not considered best practice. She would treat the walls to kill the algae and fill any fissures, re-attach flaking paint and fully expose all of the paintings by gently taking off the render. This will enable us to make a better judgement about who all of the characters are (she's a bit dubious about some of the current interpretation). She also suggested bringing in electricity when the floor is repaired. This is not for lights, but to run thermostat controlled heating. The ideal conservation temperature for the paintings is between 13 and 15 degrees celsius. She expects there are more paintings above the ones that are currently exposed, perhaps the coat of arms of the family who commissioned the work, for instance. She estimates the work will take two people two months. She commented that there was a certain amount of 'de-restoring' to do, where amateurs in the past have attempted to 'restore' certain figures. 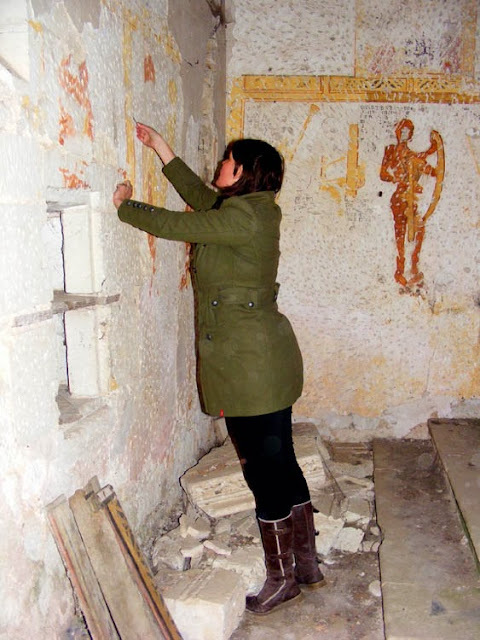 She said that in places like Saint Savin, most of the work was actually 'de-restoring'. 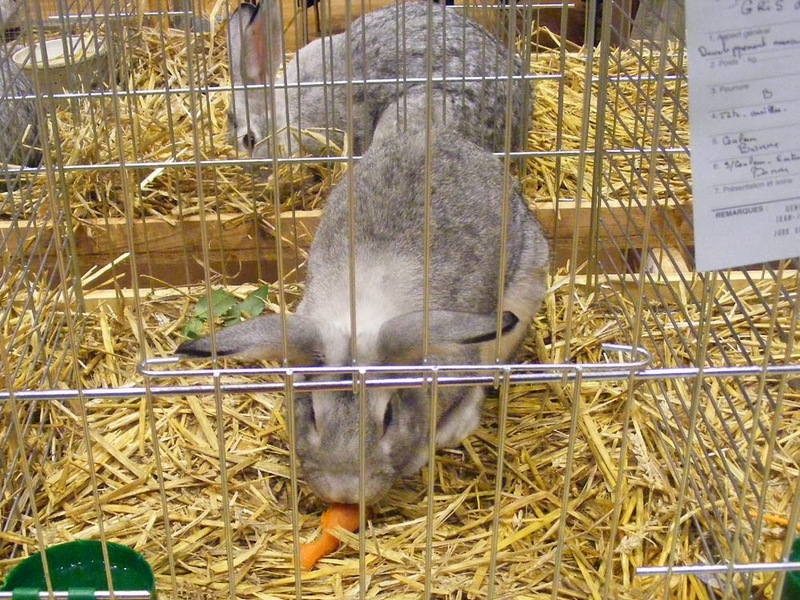 This type of grey rabbit used to be well known to the inhabitants of Indre et Loire and by the early 1900s it had begun to be called le lapin gris de Touraine. They were raised for meat and fur, but although still common on farms in the area in the 1950s, by the end of the 20th century they had almost disappeared. 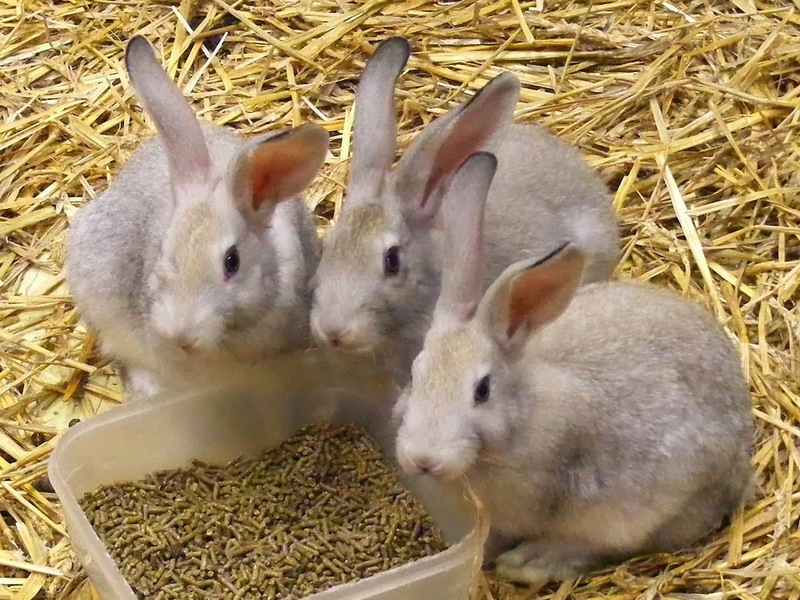 It has just received official recognition as a breed, after a group of enthusiasts worked on saving the rabbit from extinction. Showing the characteristic white collar. Ideal Weight (poids) -- 3.75 kg to 4.5 kg. 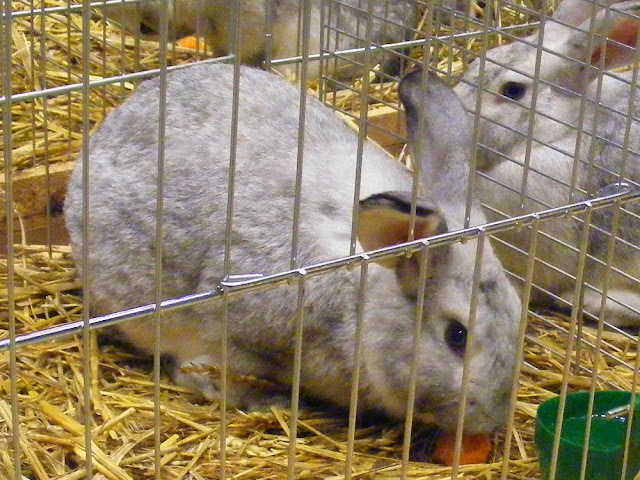 Colour (couleur) -- light grey on the upper body, becoming white below. A white collar and white around the eyes. Pelt (fourrure) -- the fur should be about 3 cm long. Head (tête) -- should be slightly domed and roman nosed. The fur should be a bit darker in colour than the body. Eyes (yeux) -- should be lively and blue-grey. 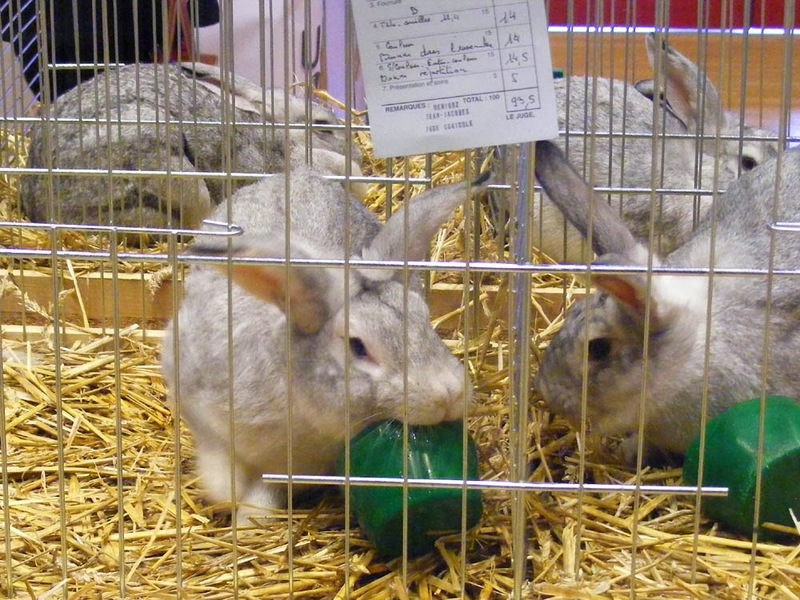 Ears (oreilles) -- should be velvety and well covered in fur at the base. The ideal length is 12 cm to 13.5 cm. The rabbits are mainly raised in hutches (clapiers). Females have a gestation of 30 days and produce litters of 6 - 8 kits, sometimes 10. She will suckle the babies for 6 - 7 weeks. The rabbits eat grass and roots such as carrots and forage beets. When housed in hutches they also have lucerne hay and commercial granules. They are raised principally for their excellent, low fat meat. This rabbit scored 94 out of 100 -- good, but not enough to win. Here is his score card. 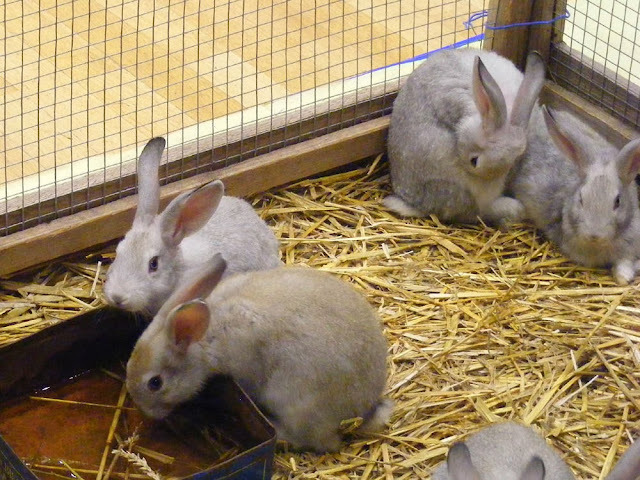 I'm fairly hard-boiled about these sort of issues, but quite frankly, these rabbits are so adorable and cuddly I don't know how people can bear to eat them. Our friends from Blois, Rosemary and Jean Michel, came to lunch recently and brought two dozen #2 spéciales oysters from Normandy with them. They also brought a nifty device for holding the oyster and a poinceau ('punch') for opening them. Jean Michel, fetchingly attired in my purple pinny, wielded the knife and Rosemary took the opened oysters and plated them. I was interested that they quite deliberately drained the oysters. I was taught to keep the oyster horizontal in order not to lose a drop of precious salty liquor. The oysters were served with wedges of lemon, multigrain bread, butter and a fruity 2012 Touraine sauvignon blanc from Domaine des Corbillieres in Oisly. Rosemary explained that they prefer the spéciales to the fines claires as the latter don't have the nice meaty nugget. She commented that they shop around to find a producer or fishmonger selling ones that are to their taste, which is not too salty, and they think that the #3s are too small. I'm hoping Rosemary will comment below and give a bit more detail on their oyster buying and preparing strategy. 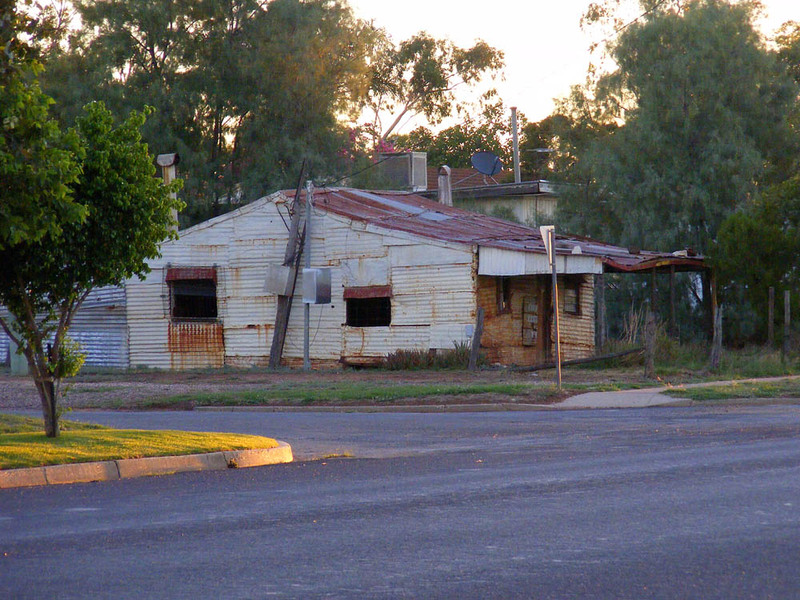 Corrugated iron is an Australian icon in my opinion. I love it. For much of my life in Australia I lived in houses with corrugated iron roofs. One of the things I found odd about moving to London was living in a house with a tile roof -- you couldn't lie in bed and listen to the rain on the roof -- it was virtually silent! Here in France, slate isn't any better. You have to look out the window to know if it is raining or not. A corrugated iron shanty in the middle of Lightning Ridge, an opal mining town in western Queensland. This rudimentary miner's hut has been kept as a piece of history. 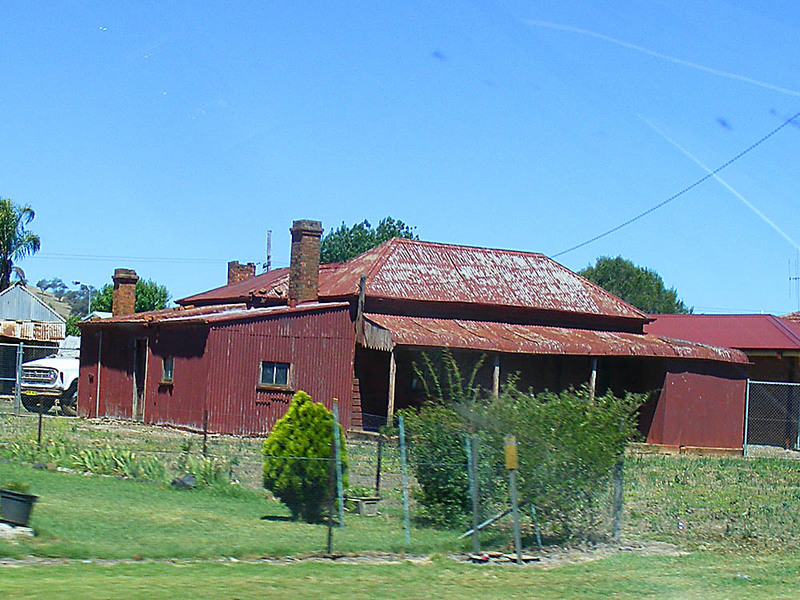 A row of houses in Dubbo, on the New South Wales western plains. 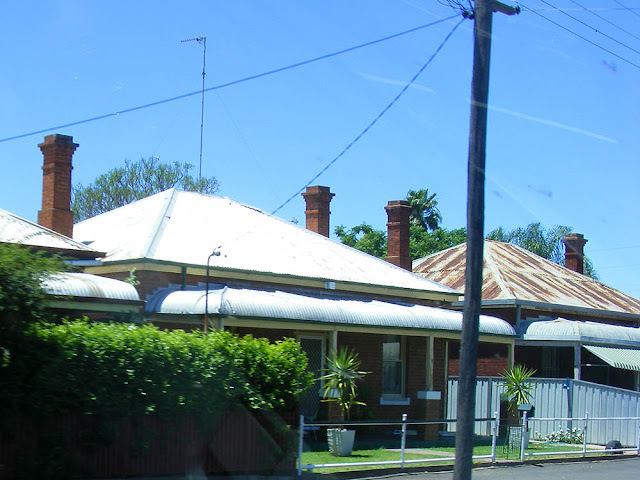 They are brick, but with typical corrugated iron roofs, including verandahs with the classic bull-nosed profile. An old weatherboard house in Wellington, western New South Wales, that has been extended with a corrugated iron lean-to. Part of the veranda has also been enclosed, a very common approach to enlarging these old homes. The colour on the iron is not rust for the most part, but a thoroughly unattractive but widely used and hard wearing paint in a colour known as 'mission brown'. 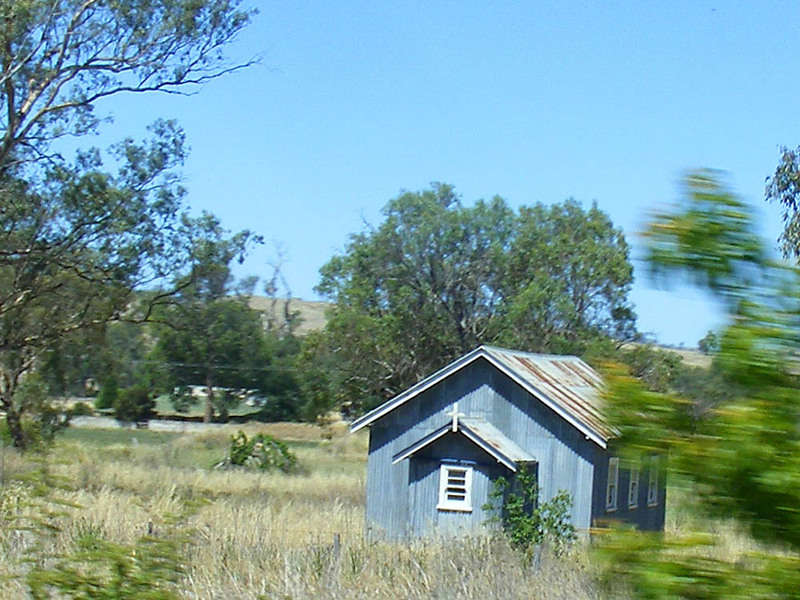 A tiny church in corrugated iron, at Neurea, on the Mitchell Highway, New South Wales. 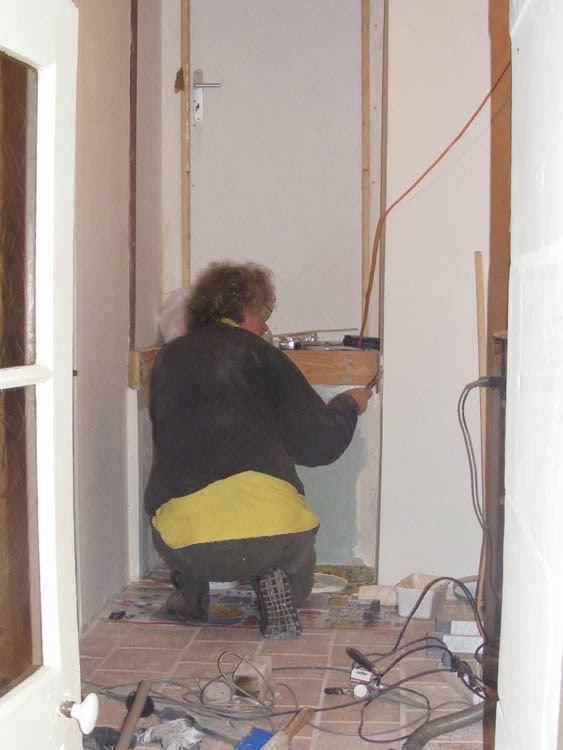 A la maison hier: Simon worked on mouse and draught proofing the pantry. The bottom portion of one wall runs along the vide sanitaire (ventilation space) of the graineterie (granary), so has just been roughly infilled in the past, with plenty of crevices and a great void behind. Au jardin hier: I planted yellow Stuttgarter onion sets and sowed broad beans (long podded feves de Seville). I've grown both before with success, but this is the first time I've tried sowing the broad beans in autumn rather than early spring. This is the image most Australians would conjure up if you asked them to describe a typical Australian pub. It's 19th century, with cast iron lace around its upper veranda, cast iron posts creating a colonnade underneath. It's large and imposing on the outside, dark and cool on the inside. This particular pub is in Wellington, in western New South Wales. 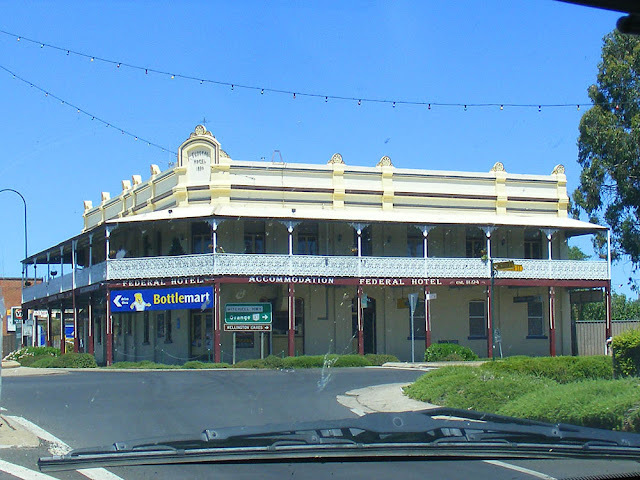 I assume it has not always been called the Federal Hotel, as Federation (of the separate self-governing British colonies to form one independent nation) only occurred in 1901, and the date on the facade says 1894. Perhaps I am wrong though, and the original owners were expressing their solidarity with the emerging nationalist movement. a series of lectures about the 'Secret War', which covered the clandestine activities of the British Special Operations Executive (SOE) and the French Resistance during the Second World War. Our friend John came along with us as he has a particular interest in this period of history, and in old cars. Saint Amand Montrond is a couple of hours to the east of us, in the old province of Berry (modern day Indre and Cher) and we needed to be at the venue at 2.30 pm, so we decided to leave home mid morning and lunch at a restaurant along the way. We hit Lignieres around about lunchtime and decided to stop there. We've been to Lignieres before, as it was where we got very lost a couple of years ago trying to find the Prieuré d'Orsan. Simon quite fancied going to Les Trois Perdrix in Lignieres, a restaurant which specialises in haggis, curry and fish and chips, but to my relief, they were closed. (Apparently the owners are British, and we learnt from Dan's son Pierre that in fact they do excellent fish and chips.) We settled for the local creperie, and John very kindly footed the bill. 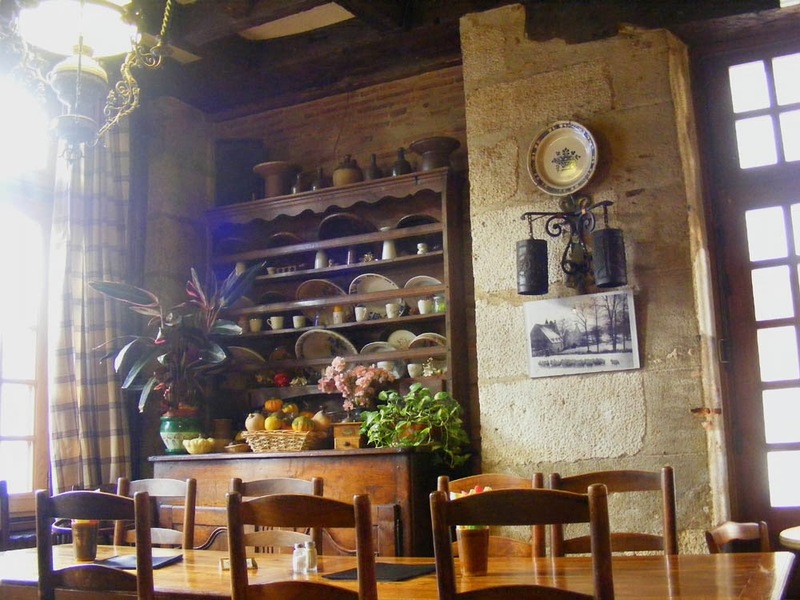 We liked the authentically rustic interior -- it was one of those places that designers outside of France try desperately to reproduce and never get quite right. L'Europe, reinforced concrete, by the Sudanese sculptor Fabian Latorre. Once lunch was done we headed off to Dan and Marie Christine's. 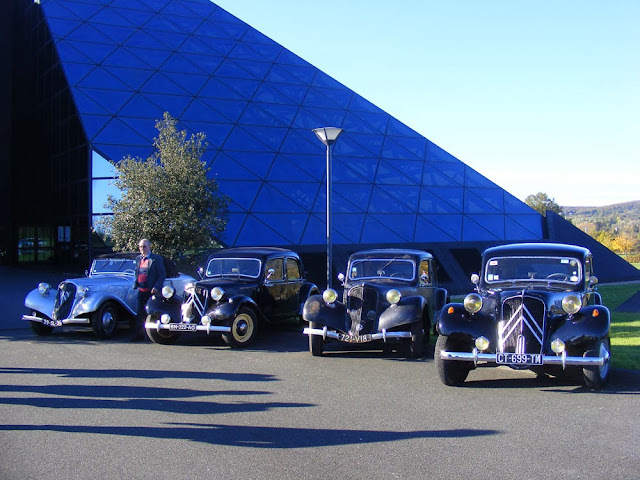 After a brief stop for coffee with the gathered Tractionistes we drove in convoy through Saint Amand Montrond and to the Cité de l'Or, which was the venue for the event. This town of 12 000 people is notable for the quantity and quality of their public art, mostly statuary. L' Amour, bronze, by Louis Derbré, who grew up in the Pays de la Loire. The Cité de l'Or is an impressive glass pyramid which functions as a cultural centre, with lecture theatre, museum and gallery spaces and a shop to showcase the local products. I asked Marie Christine why it was called the 'City of Gold' and she said it was because 'there is gold here'. I initially interpreted that as meaning that there was gold in the river or surrounding hills. In fact, it is because the town is officially the third centre of goldsmithing in France, an industry that was established in the late 19th century by a Parisian jeweller. 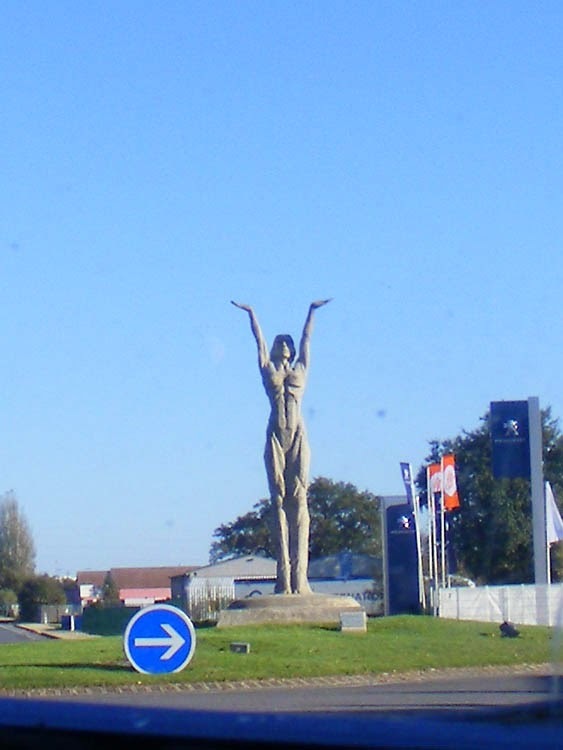 La Cité de l'Or, Saint Amand Montrond. Can you pick which one is Claudette? The jewellry on show, made by local artisans, was lovely, very wearable, and by no means expensive. The lectures, on the other hand, were somewhat disappointing. We sat through 3 hours of someone who was clearly passionate about his subject, but not a good public speaker. Like most enthusiasts he tried to impart too much information in too little time, and he read his words in full rather than speaking from notes. John and I came away thinking we would have done better to have read the book, Simon just fell asleep. It was fascinating how well behaved the audience was though -- no shuffling, no talking amongst themselves, no coughing, no pushing past others to go to the toilet 15 times in the course of a lecture. Everyone appeared to be focused on the speaker and listening. There was no master of ceremonies either. The speaker simply started, at the appointed hour, without being introduced, and without introducing himself. At the end no one formally thanked him, although many people went up to him to personally thank him and exchange a few words. 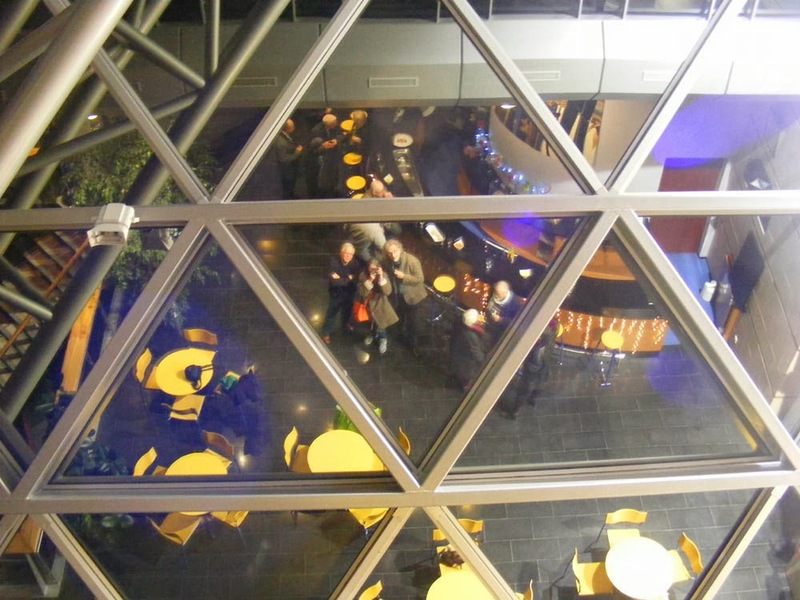 Reflected in the roof of the bar. I took this fun photo in the bar after the lectures had finished. You can see me (with the orange bag), Simon to my left and John to my right. Our friend Jean Louis is obscured by the horizontal frame above us and Dan just visible above that. After apéros at the bar in the Cité de l'Or we went back to Dan and Marie Christine's for supper. 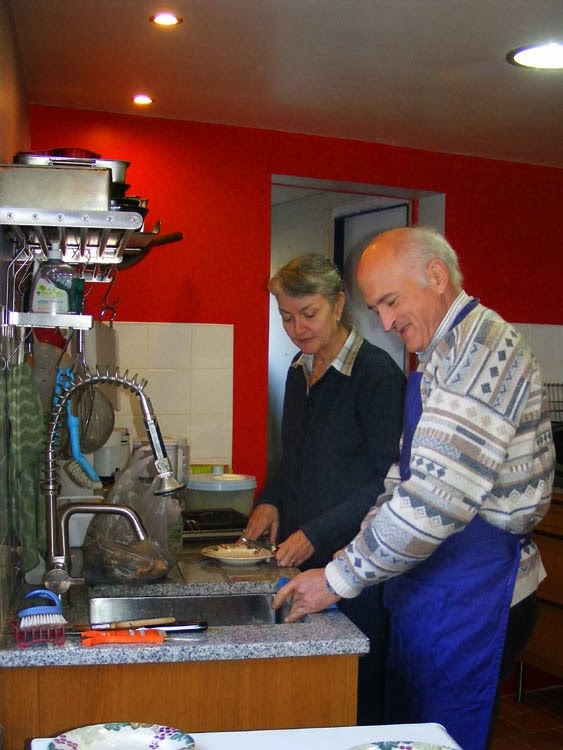 They live in a restored longere in a hamlet not far from Saint Amand. We were full of admiration for their work on the house. They actually mostly live in the barn end of the building, which has a sort of suspended staircase up to a mezzanine for the bedrooms and more or less open plan kitchen / living room on the ground floor, with a huge glass portico flooding the space with light. What with laughing, talking, eating and looking at photos of Dan and Marie Christine's trip to Australia we didn't get to bed until 3 am. 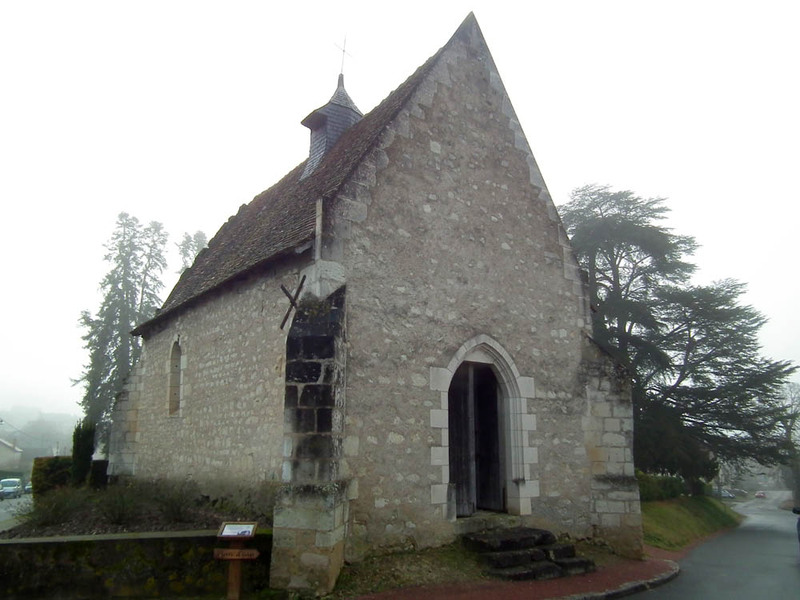 Preuilly News: I attended a very positive site meeting at the Chapelle de Tous les Saints yesterday. In attendance was an architect from the Fondation du Patrimoine and two wall paintings conservators along with our deputy mayor and the president of the local historical society. According to the latest council meeting minutes, displayed on the town notice board, our water rates are not going to go up next year, but our sewerage rates are being reviewed. Most people, when they arrive in France, have enough French to negotiate shopping quite adequately. Je voudrais ('I would like') followed by reading the name of the item off the label and pointing will get you what you want most of the time. The trickiest bits of the transaction are remembering to say bonjour before making your request and working out how much it is if you have bought multiple items and there isn't a cash register readout to take a sneaky peak at. Fairly soon, especially if you live here, you realise that shopkeepers and market stallholders are asking you questions too. Usually these questions are easy to get the gist of because of the context, but what are they actually saying? avec ceci? -- literally 'with that? ', meaning 'anything else?' The problem is it sounds like avec soucis?, which would mean 'with worries' and doesn't make any sense at all. This one had me so bemused I eventually asked a bilingual friend to explain. ce sera tout? -- literally 'that will be all? ', meaning 'will that be all?' This one sounds like ça ce ratou, but 'ratou' isn't actually a French word, so it doesn't mean anything. It took me ages, but I did eventually figure this one out myself. It can also be used as your response when asked 'avec ceci?' -- 'non, ce sera tout, merci'. ça va aller? -- literally 'that's going to go? ', meaning 'is that alright?' You hear it a lot, not just at the market, and it too can be either a question or a response depending on intonation. It usually sounds like ça va les, which I couldn't make mean anything particularly sensible, although I got very quickly that the phrase meant something similar to ça marche ('that works') when used as a statement. This one took me the longest to figure out, but it finally dawned on me, without having to ask anyone. Auchan -- pronounced Oh-shuh(n), with the stress strongly on the second syllable and just a hint of the final 'n'. It is not pronounced 'ocean', and doing so has been known to make French people laugh. 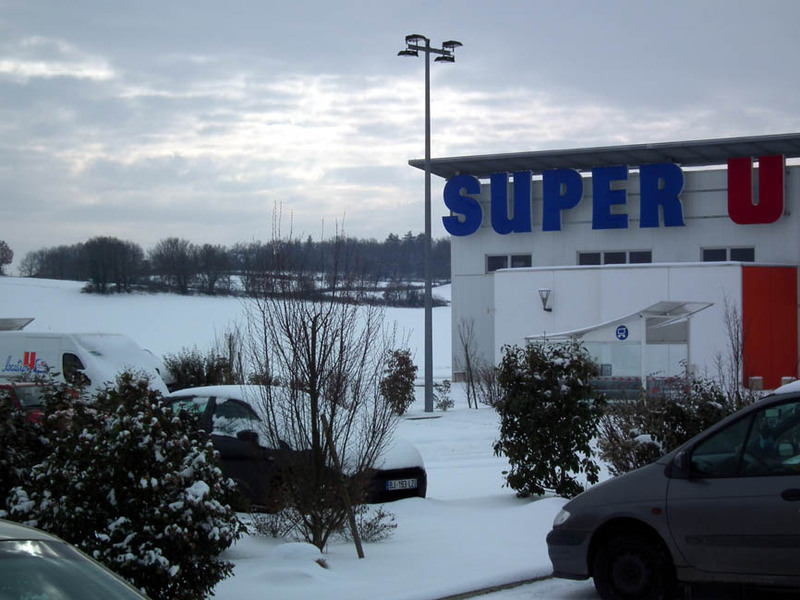 Carrefour -- pronounced Car-foor, with a slight stress on the first syllable and a proper gargling French 'r' in the middle, but not too much 'r-ing' at the end. It is not pronounced 'carry four' or 'care for'. SuperU -- pronounced Soo-pair-oo, with fairly even stress on each syllable and the final 'u' pronounced so you are almost whistling. It is not pronounced 'super you'. 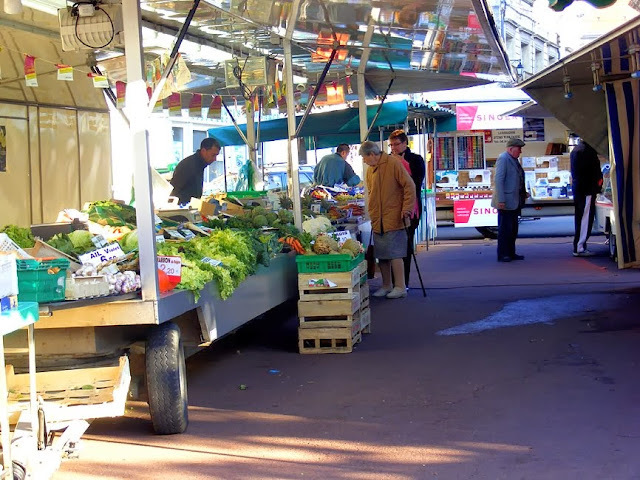 Intermarché -- pronounced uhn-tair-mar-shay, with a slight stress on the first syllable. It is not pronounced 'intermarsh' or 'intermarshay'. LeClerc -- pronounced luh-klair, with the stress on the second syllable. It is not pronounced 'lee-clerk'. UPDATE: See Ken's comments below for expert instructions on how to pronounce these words (stresses, such as they are, should be on the last syllable, for example). The news here is full of how unpopular the Socialist President Hollande is and whatever the latest humiliation for his struggling government is today. Initially voted in because people voted against the right wing Nicolas Sarkozy, his first few weeks had promise. He appointed Jean Marc Ayrault as Prime Minister and that went down a treat. Hornets fight over the remains of a windfall pear. But then his current spouse, the political journalist Valérie Treirweiler, made an astonishingly public and unashamedly disloyal statement of support for someone running against his ex spouse Ségolene Royal, and it's all gone downhill from there. Ségolene has been shafted, now relegated to regional politics, and Valérie has been quiet as a mouse for months. 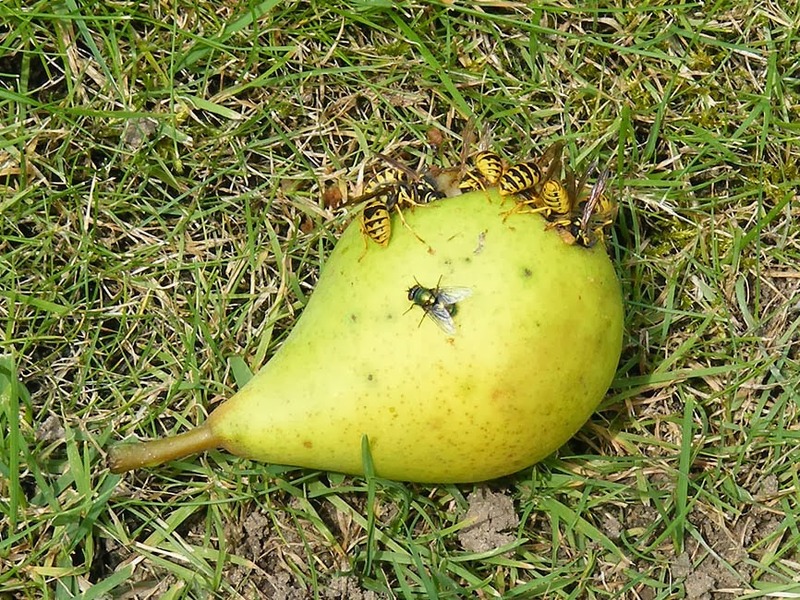 Common Wasps, like hogs at a trough. Now he is completely overshadowed by his Interior Minister Manuel Valls, who seems to have a finger in every pie going. I can't decide if he is a nasty piece of work, or whether he really is the only one in the government who can get anything done. Several Ministers have had embarrassing scandals cut their careers short, including Jérome Cahuzac who was tasked with sorting out the tax system, only to have his secret Swiss bank account revealed. 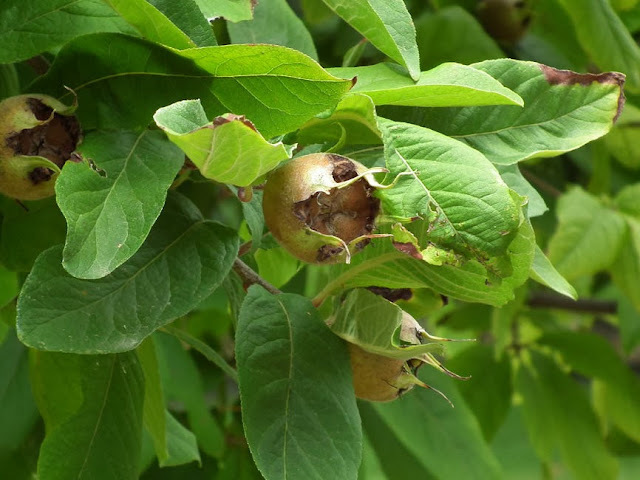 Medlar fruit, known in French as culs de chiens. Woe betide you if you are in business in France. The rumour mill is grinding constantly. It is impossible to plan anything as you never know when an attempt to change some crucial piece of legislation will be presented to parliament. Once it is public, then there are endless arguments and protests, ending up in the watering down of the proposals, and vaguer and vaguer announcements about when such legislation will actually come into effect. Young ministers such as Sylvia Pinel, are publicly contradicted by the no longer golden Ayrault. I don't have much love for Mme Pinel, as her Ministry for Trades and Tourism has caused me personally considerable angst. However, I was astounded when Ayrault undermined her attempts at business reform, behaving as if she was an inexperienced school girl and he the patronising headmaster. It is clear the left hand doesn't know what the right is doing, and that face is more important than the future of France. And the really nasty wannabes are getting louder and louder. The far right Front National is doing well in the polls and ordinary people feel free to publicly taunt a Minister of North African background in a clearly racist way. Almost completely shredded by bird attacks, this Silver-washed Fritillary butterfly struggles on. All that is just the domestic politics. Internationally, France is trying to save the EU and the Eurozone. Unfortunately, it looks like Hollande and the German Chancellor Angela Merkel do not personally like one another. Their political backgrounds are so different it seems they may not be able to work together effectively. Personally, I cannot understand why the Centerist Francois Bayrou doesn't gain more of a following as a Presidential candidate in France. My theory is he smiles too much. The distinctly unprepossessing parasitic fly Tachina grossa. Lichen Outing: The Association de Botanique et de Mycologie de Sainte Maure de Touraine is holding an outing in Sainte Maure to look at lichens on Sunday 24 November. Meet at 2 pm in front of the mairie. Don't forget to bring your loupe. A la cuisine hier: Slow-roasted Shoulder of Lamb. 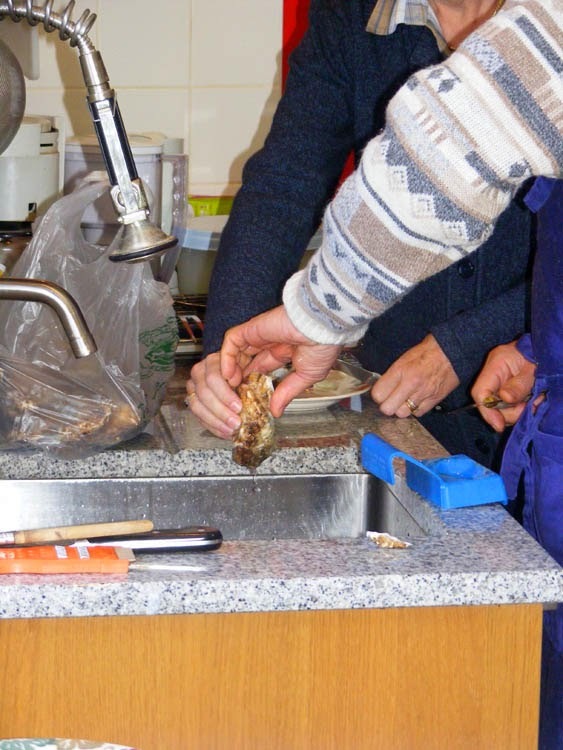 I bought the lamb shoulder at the butcher in Preuilly. 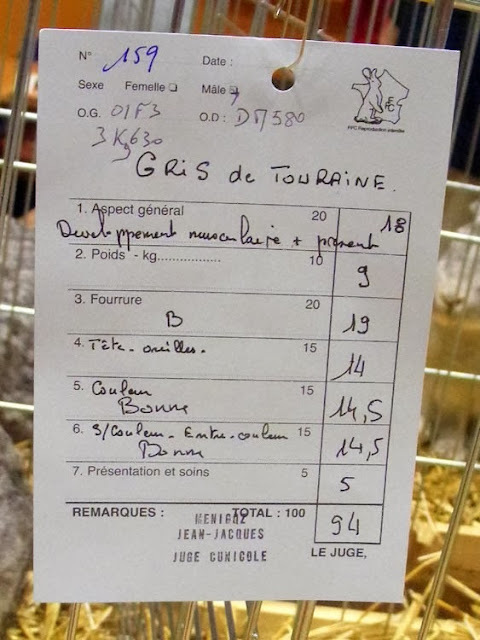 It weighed 1.5 kg and was priced at €15/kg. As usual we discussed how I was going to cook the meat and the butcher asked me if I wanted him to remove the bones. I said no, but he recommended removing just the shoulder blade itself, and I agreed (he also very kindly weighed it sans shoulder bone when he charged me). He told me that prepared like that it is called épaule d'agneau, façon gigot. 7-hour Lamb is a well known dish here, so he gave me the benefit of his opinion about how one should cook it. He says even for a leg 7 hours is too long and if you cook it that long you will end up with nothing. He says for modern legs of lamb in modern ovens 5 hours at 120°C is about right, and less for shoulder, which is not so thick. He is also an advocate of not salting prior to cooking, but after. He has taken on an apprentice, who is about 16 years old I would guess, and was absolutely not going to interact with me. I asked him in my best embarrassing middle aged middle class patronising foreign lady manner if he was learning lots and got a grunt and a shrug (presumably Gallic) in response. He did however bid me au revoir when I left. Even for the callowest of youths it would be unthinkable not to do so. Last time I was at the butcher's he was discussing the difficulties of taking on an apprentice with one of the local joiners. I thought he had decided against it because it would involve changing his opening hours and other logistical moves. Apparently an employer is required to give apprentices two consecutive days off, and the butcher closes on Thursdays and Sundays. A Vine Collection at Risk: The Institute of Agronomy Research (INRA) holds a unique collection of more than 40 grape vine varieties from around the world at Domaine de Vassal in the south of France. It is the largest reference collection of its kind and because of the way they are grown they are phylloxera free. Most importantly, this is a living archive, including many old and forgotten varieties, and is a gene pool like no other. Because of funding issues there is a proposal to move the vines which could impact very heavily on the collections survival. If you care about such things, please sign the online petition to save the collection on its current site. Thanks to Jim's Loire for alerting me to this situation. What do you get if you cross a mince pie with a croissant? 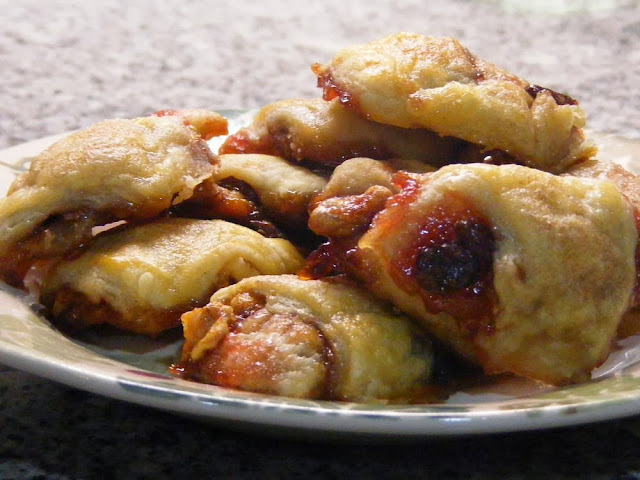 Answer: Rugelach (singular 'rugela'), Yiddish pastries with origins that date back centuries, made with cultured milk or cream, traditionally filled with dried fruit, nuts, cinnamon and honey. Nowadays the buttermilk or sour cream is usually replaced by cream cheese and the honey with jam (usually apricot). Sometimes chocolate chips replace the sultanas and sometimes chocolate hazelnut paste replaces the jam. A few people leave out the jam altogether, and I have no doubt that just spreading them with British style fruit mincemeat would work very well. 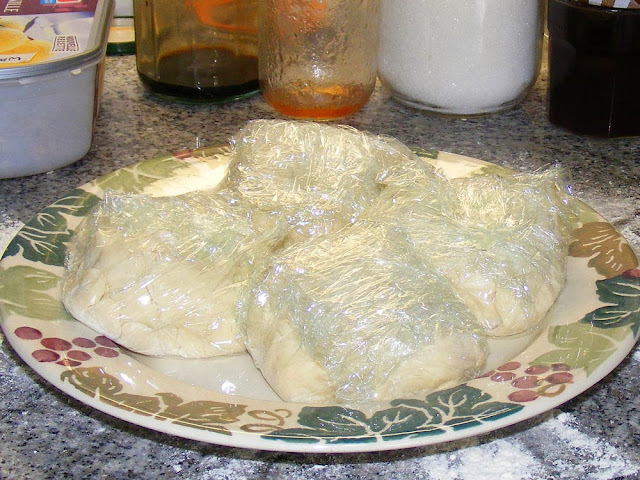 The dough divided and ready to be chilled. I'd never heard of them before, but discovered them when I was looking for recipes that used walnuts. 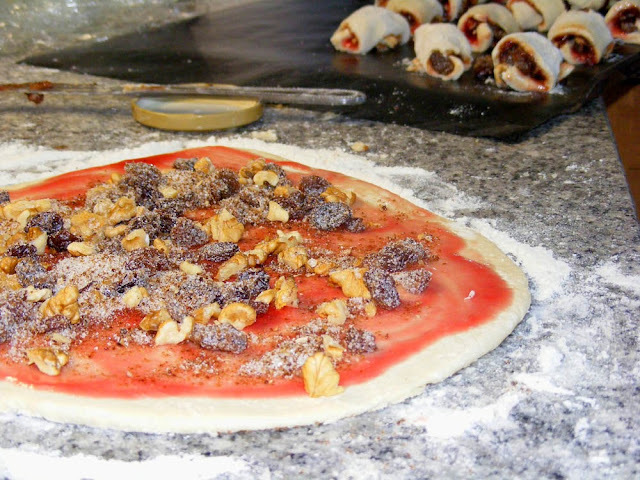 Dried fruit, our home grown walnuts, sugar and spice mixed together for the filling. A pastry disc with filling spread on top prior to cutting and rolling. Cream the butter and ¼ cup sugar. Beat in the flour alternating with the buttermilk. Divide the dough into 4, wrap in clingfilm and refrigerate for at least an hour. 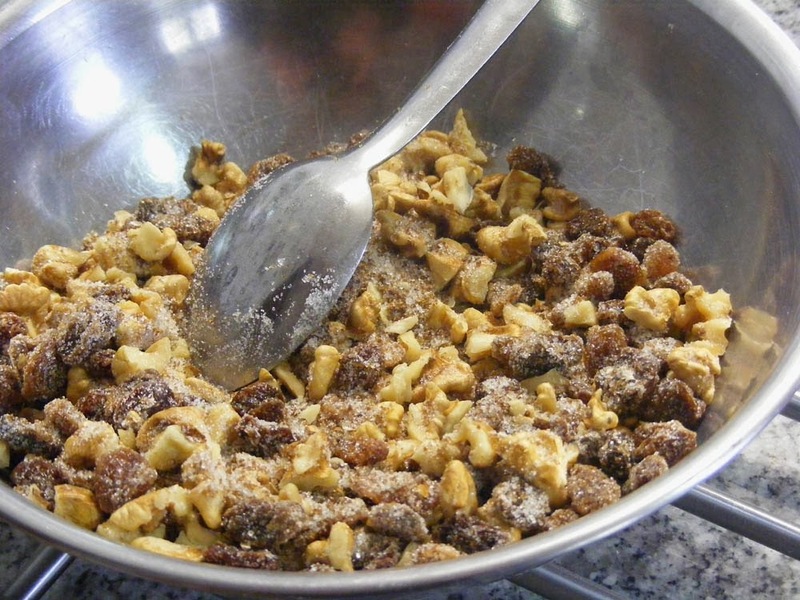 Make the filling by combining 6 tablespoons of sugar, brown sugar, half the cinnamon, and the sultanas and nuts. Roll out one of the dough balls into a 20 cm disc. Keep the rest refrigerated. Spread the dough circle with a tablespoon of honey or jam. Sprinkle half a cup of filling evenly over the disc and press it lightly into the dough. Cut the disc into quarter wedges, then each quarter into 3 wedges. Starting on the outside and working to the point, roll each wedge up and place on a lined baking sheet. Brush each pastry with the wash and sprinkle with the remaining cinnamon and sugar. Bake for 20 minutes then cool on a wire rack. Although the pastry is quite well behaved it is extremely soft, so it is crucial to take the time to chill it periodically as outlined in the recipe. Rolled pastries ready for their pre-baking spell in the fridge. 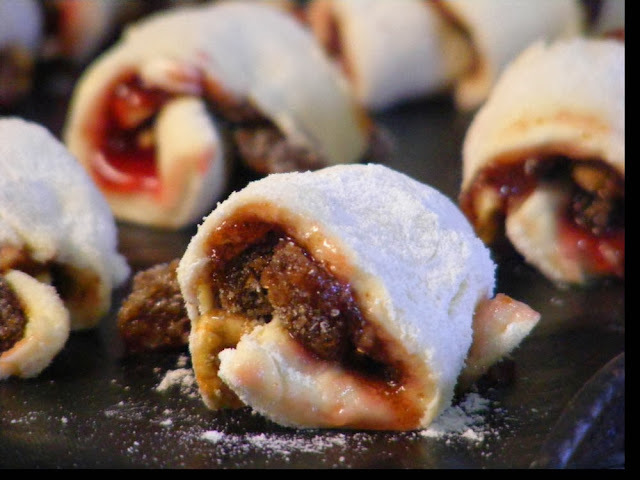 This recipe makes 48 small pastries, and Simon and I scoffed half of them in a single evening. Consume with a small glass of homemade liqueur de noix for extreme satisfaction. Au jardin hier: I cleared the tomato bed and prepared a bed for the yellow Stuttgarter onions that Tim very kindly procured for me. I hoed, weeded, cultivated and raked, taking advantage of the fact that it has not rained for 3 days. I ended up wearing fairly substantial mud galoshes, but although it was 3°C and the fog never lifted it was surprisingly pleasant down in the potager. A la cuisine hier: Rabbit sausages from the local rabbito, mixed root vegetable mash and steamed buttered spinach, followed my version of the Tourangelle gateau médiévale served with creamy custard. Simon has been hard at work on our entry hall the past 10 days or so. It seemed like it only needed a few finishing touches after we cleared it of the junk that testified to where we stopped work two years ago (!!). But it's amazing how long these little jobs can take. And how well I remember how much I hate stone and plaster dust. 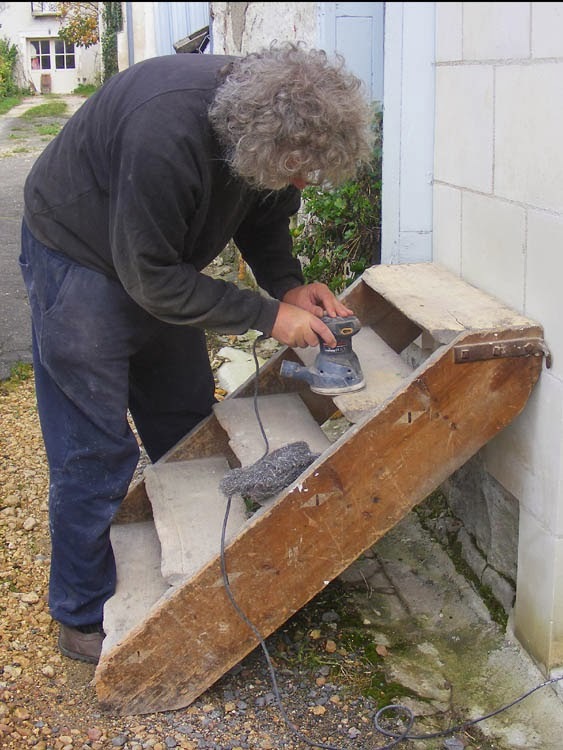 Simon sanding the graineterie (granary) steps. 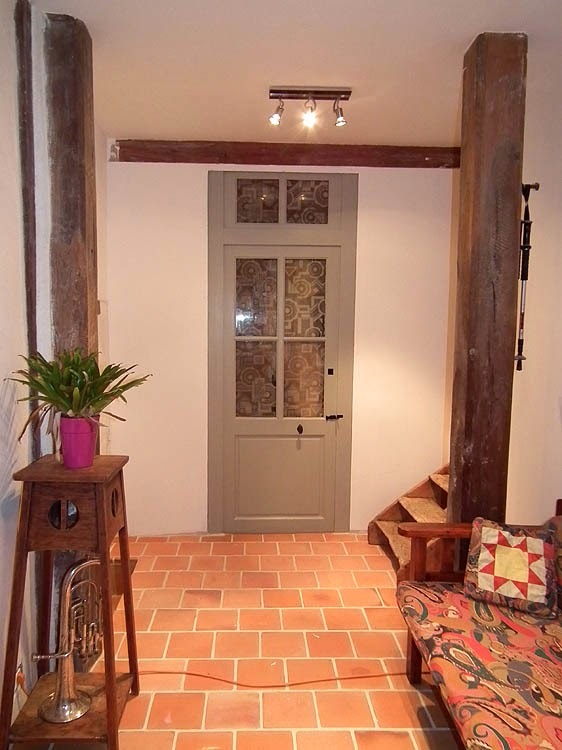 The entry hall provides internal access to both the house and the graineterie, and these removeable steps take you up from ground level to the granary's floor level. In the fullness of time these will be replaced with new, less rickety steps and become a display stage. 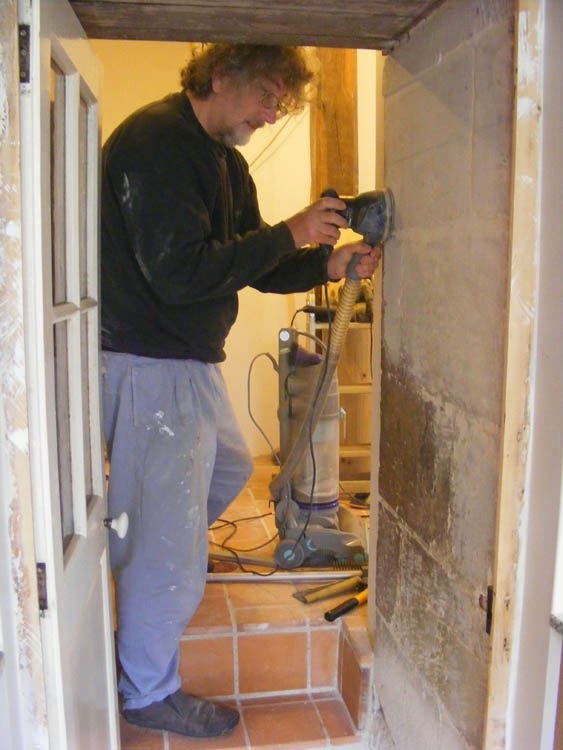 Simon sanding the stone doorway between the kitchen and the entry hall. You can see how thick the wall is and how dirty (note the gunge coloured patch underneath where he is working). Also note his ingenious coupling of the sander to the Dyson vacuum cleaner, which has had its filters removed to stop them clogging instantaneously with near talc quality limestone dust. This photo is posed - even with the Dyson attached you wouldn't be able to see Simon for the cloud of dust. 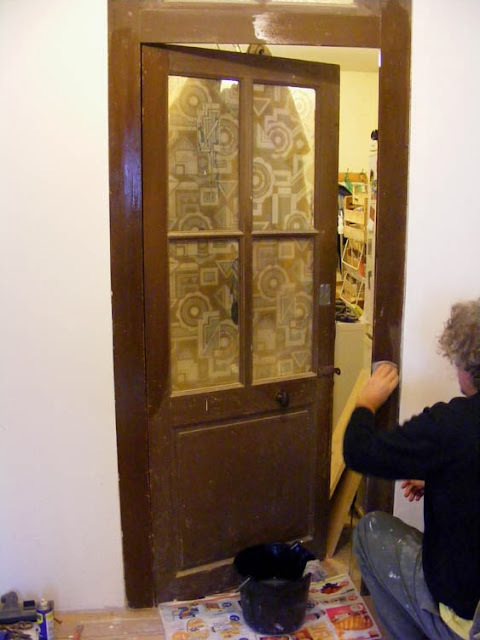 Simon preps the pantry door for painting. When this was a working grain merchant's this was the office door, which comes off the end of the entry hall opposite the front door. It's shiny because it's wet - the true colour of the woodwork was the bottom panel of the door: mission brown! Well almost. Still no skirting board or mouldings, but the lights are done and everything is clean. The freshly painted pantry door looks so much nicer. We were greatly amused to see how well the new paint goes with the scuzzy opaque film on the glass. A la cuisine hier: Vegetarian Samosa Pie, served with lime pickle and a dollop of yoghurt. The pie is a potato based samosa filling put into a pie dish, covered in pastry and baked, rather doing the traditional triangular deep fried samosas. In the 1970s road safety around the world became an issue. Road deaths in some countries were higher per 100 000 of population than troop losses in World War I. In Australia there were 31 deaths per 100K of population, and in France 32.3. France had the reputation of being the most dangerous country in the world in which to drive. By 1972 Australia had introduced the compulsory wearing of seat belts in both front and back seats and the death toll halved within 12 months. The French authorities saw these results and introduced similar legislation in 1973, also with very satisfactory effects. In both countries government will and the 'silent majority' coincided in their views and seat belts became part of life -- literally. The next big issue was drink driving. Both countries introduced drink driving legislation, Australia in 1976 and France in 1978, setting low limits of blood alcohol for drivers and enabling the police to test drivers. Nothing much happened -- in practice the law wasn't enforced in either country, mainly because there was not really the mobile technology to do so. The change came in Australia in 1982, when the police in New South Wales started a massive random breath testing campaign with new equipment. There was also a huge driver education campaign which flooded the media with extremely blunt messages ('If you drink then drive, you're a bloody idiot') with images to match. Once again the effect was immediate, because now there was a significant chance you would be caught. It took France considerably longer to get a government willing to tackle their drink driving culture, but in 2003 the issue of drink driving was linked with health politically. The government of the day was very strongly committed to enforcing and strengthening existing drink driving legislation, and in 2004 a délégué à la sécurité routière ('road safety tzar') was appointed, who developed a very high personal profile and a successful driver education media campaign. The police began random breath testing and by 2006 France was one of only four EU countries meeting targets for percentage of population tested for alcohol while driving. Once again, the silent majority turned out to be in favour, and death tolls dropped. 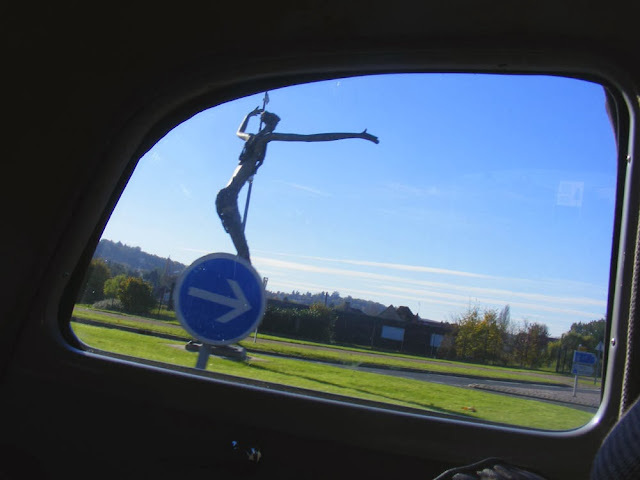 According to one report by a French road safety expert that I read, it was as if France turned into a different country in which to drive overnight. It apparently caught certain foreign holidaymakers by surprise, as they would come over the Channel or cross the border expecting to be able to break all the rules with impunity, and fines dealt to foreign drivers went up considerably for a few years after 2003. Of course there are still people who drive after drinking, but all French people know the slogan 'Boire ou conduire, il faut choisir' ('drink or drive, you have to choose'). Coupled with the improvement in vehicles and roads, the road toll is now down to 6.1 per 100K in France and 6 per 100K in Australia. This is still twice the level of deaths in the UK, but half that of the US. In both France and Australia the seat belt campaign is won, the drink driving campaign has been a great success but remains ongoing, speeding rears its ugly head from time to time and now the use of mobile phones while driving. Driver education combined with the political will to fund education and enforcement is the key. You cannot just announce that road safety is a good thing and hope that people will behave appropriately. The investment by government in education and enforcement is repaid many times by savings in medical care, accident investigation and insurance payouts. All along the Castlereagh Highway, in south western Queensland, these signs were posted on farm gates. 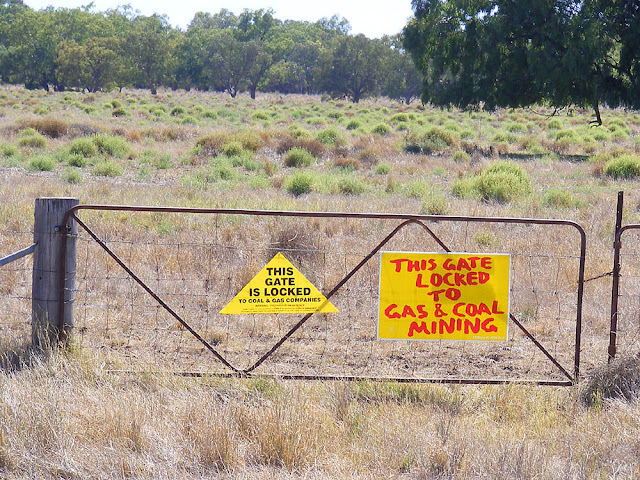 I would say about 50% of the gates displayed signs indicating that the property owners were fighting against the coal seam gas (CSG) exploration and mining that is going on in this area. The principal issue is the damage such mining does to agricultural land and that the boom in mining comes at the expense of agriculture and conservation. My impression is that the community in this region, once very tightknit, is now deeply divided, into pro- and anti-mining camps. The signs are supplied to landowners by the Lock the Gate Alliance, a somewhat unexpected association of 160 community groups, conservationists and farmers in Queensland and New South Wales. They are a way of demonstrating a form of legal non-cooperation with the mining companies, who are reluctant to take every single landholder to court in order to gain access to property. Landowners only own the land to the depth of 1 metre, and mining rights are owned by the Commonwealth of Australia. Mining companies apply to the statutory authority to be granted licences to conduct exploratory ventures and full blown mining operations. Modern mining does not necessarily provide many jobs, and the residents of these areas are concerned about the legacy it leaves the next generation. Social problems due to the FIFO lifestyle many mining company employees choose are causing a lot of media chatter in Australia at the moment. It's not locals who get the jobs with the mining companies, it's people they Fly In and Fly Out. Consequently they don't bring their families to boost school numbers and shop locally. Nevertheless, some of these western towns look much more prosperous than the last time we saw them. My concern would be 'but for how long?' Does it all dwindle away when the underground resources are exhausted and what are the ongoing consequences of mining on the environment once the mining company relinquishes direct responsibility for a site. There are well known concerns regarding the so called production water which is a by product of coal seam gas extraction. This water can be contaminated in a variety of ways, from merely saline right up to radioactive. Naturally, local people have concerns about how this water is stored, processed and ultimately returned to the environment. The people associated with the Lock the Gate movement have genuine and legitimate concerns about mining in Australia, but although they dominate the social media and discussion forums on the subject of coal seam gas mining, I can't help feeling they would do well to seek some serious scientific allies as well, for those of us who would like a balanced and scientific analysis of the situation rather than an emotional opinion. It is striking, and worrying, how comparatively rarely CSG is given any indepth reportage in the national newspapers. If you want to read more about CSG and fracking, I suggest you start with Robert Llewellyn's superb overview for the (British) layman here. A la cuisine hier: Mini apple turnovers, made with some leftover flaky pastry and dusted with cinnamon and sugar. All gone now. 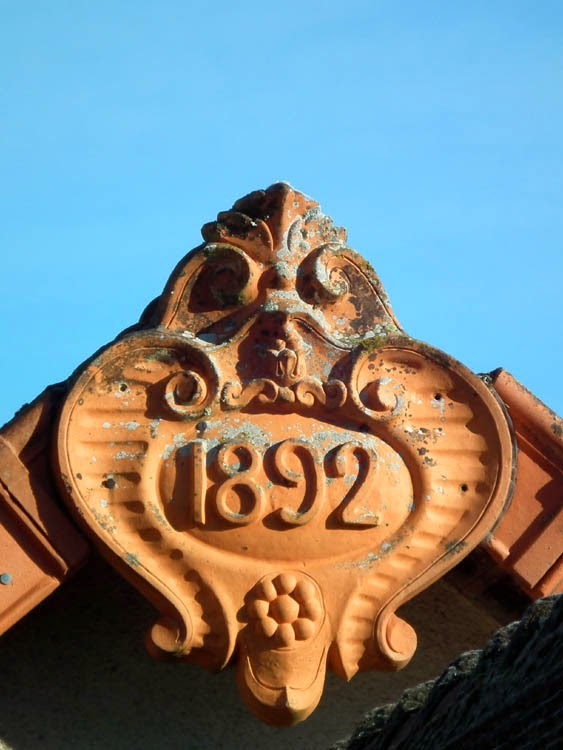 This attractive terracotta roof finial is on the Preuilly Primary School. Preuilly is lucky in that it has a reasonable sized school. Many of the villages around here operate one teacher schools and every year there is a campaign to save them. Every year Preuilly announces that it may have to drop a class or amalgamate two classes. The small villages guard their right to a school of their own jealously and see Preuilly's (modest) size as predatory. If the village schools closed, this is where the kids would come. I had a conversation recently with a school mum from a nearby village in the same situation as Preuilly. Thanks to some strong political will, their school has absorbed the surrounding villages' pupils. It has resulted in children being better socialised and having access to more resources. She feels it has been a completely positive move. A la cuisine hier: Pizza, with tomato, mozzarella, mushrooms and onions. This time last year we were beginning our journey out to Australia via China. Over the course of the following month we used all and more of the above tickets, timetables and schematic maps as well as spending on petrol what we spend on diesel in France for a whole year. A la cuisine hier: Masoor Dal Palak (Red Lentils and Spinach Curry). Au jardin hier: Apeldoorn Tulips planted, and some irises from Alice and a rosemary bush from Sweetpea. A la marché hier: Cave grown chestnut mushrooms, buckwheat honey, summer flower honey, cantal de Salers cheese, bleu de Causses cheese, goat chops, wild boar terrine, beetroot, parsnip, celeriac, spinach, peppers, chili, raspberries. Total spend €45. 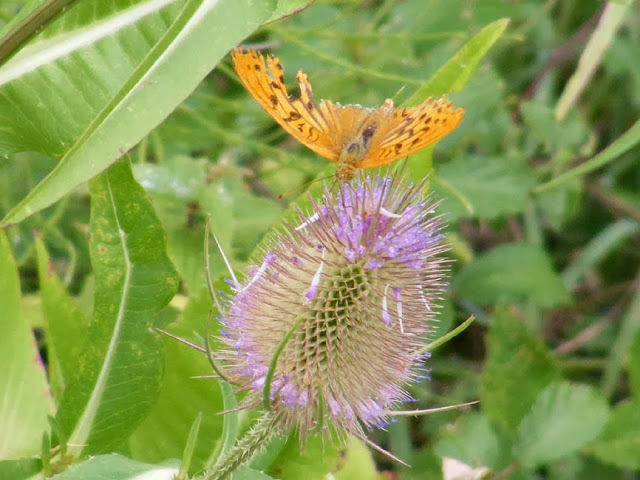 Loire Valley Nature: A new entry has been added for the Gatekeeper butterfly Pyronia tithonus. A new entry has been added for the Meadow Brown butterfly Maniola jurtina. Photos have been added to the Glanville Fritillary butterfly Mellitea cinxa page. Mid-October, when this photo was taken, is the time for autumn colour here. 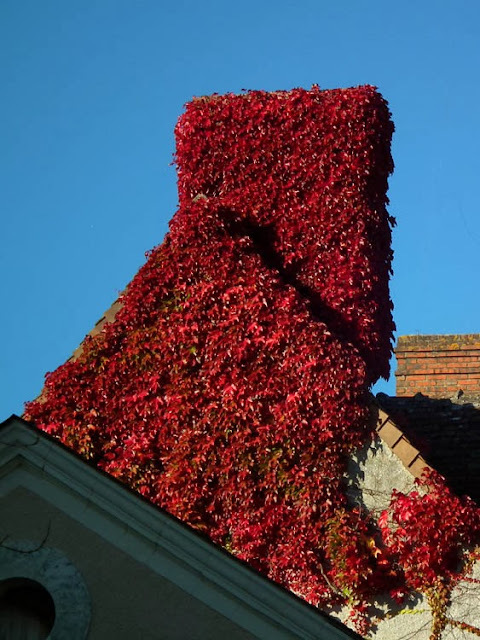 It is principally provided by the Parthenocissus spp vines (Virginia Creeper and Boston Ivy) which cover many houses. They are not native, but thrive in our temperate climate. It doesn't get cold enough for the native trees in the forests to put on much of a display, but these members of the grape vine family can be relied upon. You do have to keep them under control or they will end up in your house as well as on it, but there is a modern school of thought that encourages their presence as added insulation. The way they cling to the walls is less invasive than ivy and causes less damage. 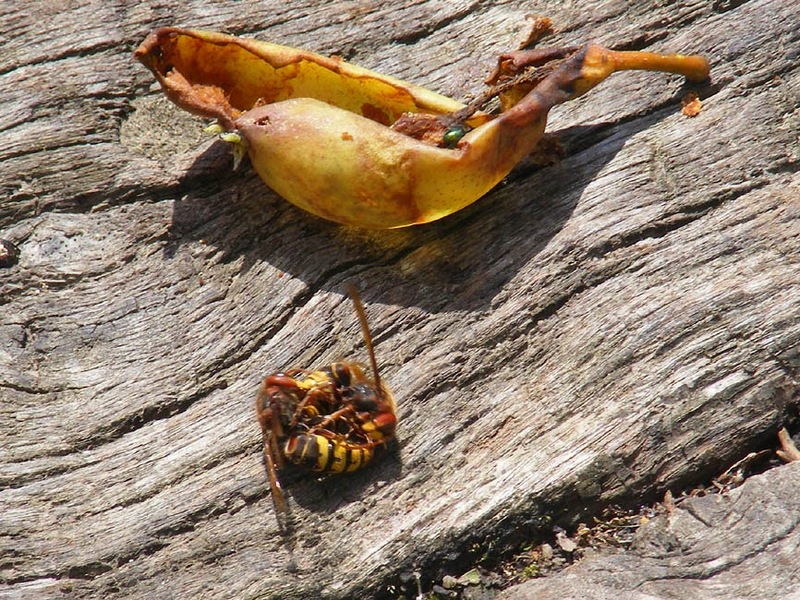 The down side is that you have to kill the plant in order to remove it should any building maintenance require it. Loire Valley Nature: a new entry for Digger Wasps Crabronidae has been added. A new entry has been added for the Comma butterfly Polygonia c-album has been added. Photos have been added to the Common Blue butterfly Polyommatus icarus entry. Photos of the distinctive and easy to identify (for once!) 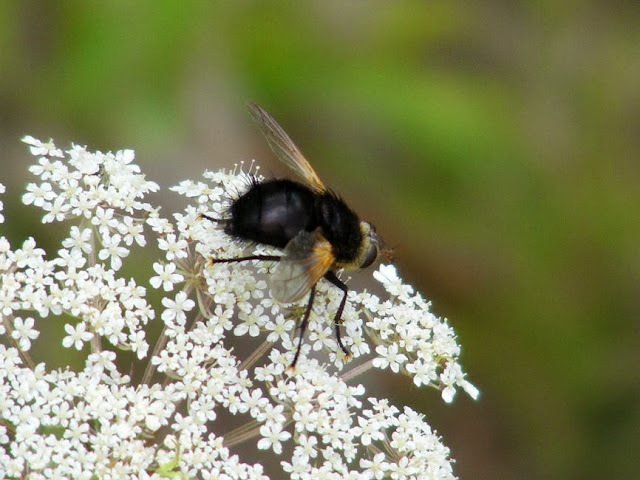 Cylindromyia bicolor have been added to the Parasitic Flies Tachinidae entry. Photos of Downy Oak Quercus pubescens have been added to the Oaks Quercus spp entry. Photos of a Little Egret Egretta garzetta have been added to the Herons and Bitterns Ardeidae entry. Photos of a 'wild' flower meadow have been added to the Gardens Habitat entry.